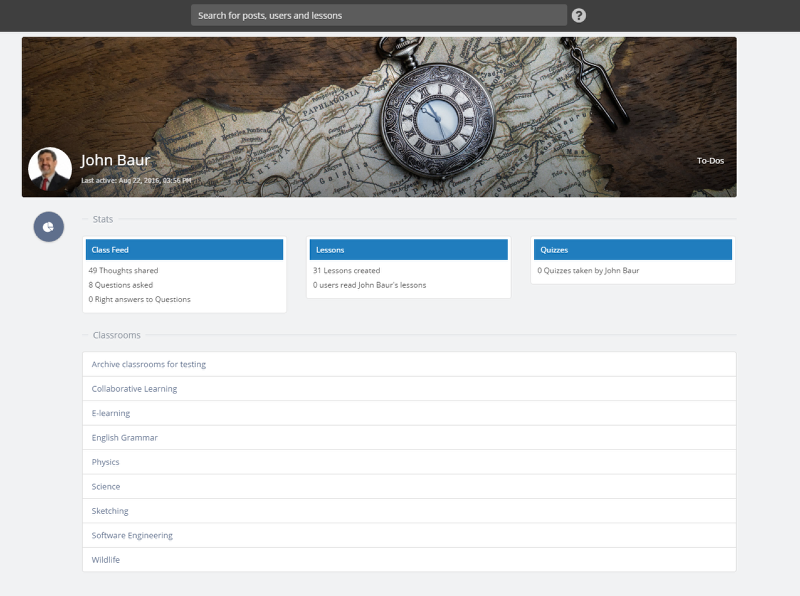 As a cover teacher, you will be able to access and view the classrooms of any other teacher on the site. Sometimes teachers go on leave or vacation, and other teachers need to cover up for them. For this, the cover teacher would need a quick access to the classrooms of the teacher who is absent. This will help the cover teacher gets up to speed with whatever the teachings that have been happening in the classroom and then can guide the learners accordingly. Although administrator could temporarily add the cover teacher to the classroom he/she is covering, this would put a significant workload on the administrator. So, we decided to come up with the concept of cover teacher. This would be an optional feature, which would allow any teacher to view any other teacher’s classroom! Yup, we broke down the walls separating the classrooms! 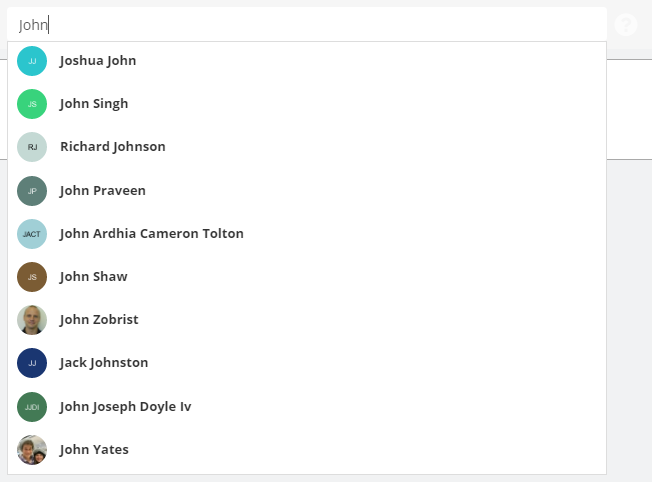 Teachers can now search for any users on the site and click on the suggestions that appear and navigate to that teacher's profile. 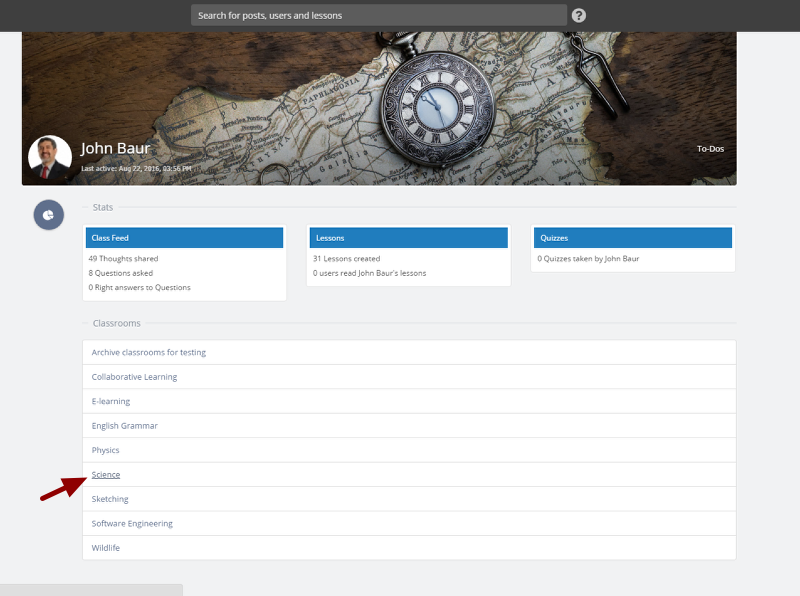 And on the teacher's profile, you can navigate to any classroom of that teacher and get view-only access to it. Access permissions of the cover teachers can be controlled for classroom newsfeed, classroom materials, classroom dashboards, gradebook, and stories. For instance, if the cover teacher is given access to the “Materials” tab of any other teacher’s classroom, he/she can view the learners progress in that classroom. For example, in lessons reading and assessments submissions. This is a view-only access and the cover teacher will not be able to view learners submissions or grade the submissions. Likewise, if cover teacher is given access to the posts of other classrooms, he/she can view them but not comment or reply on them. As a cover teacher, you can search any teacher’s profile. It is very useful when you want to access any teacher's classrooms. Let's see how you can do it. 1. Click on the omnipresent search box present at the top everywhere in Dash. 2. A list of teachers' name appears when you start typing. 3. Click the teacher's name that you will be covering. 4. Voila, you have landed on the teacher's profile page! You can access any teachers classroom from either the direct URL link of that classroom or from his/her profile page. Let's see how you can do this. 1. View the teacher's profile. 2. Click on the required classroom from the Classrooms list. 3. Now you can access the classroom you wanted. 1. What kind of access will the cover teacher have? Cover teacher will only have view-only access to any content that he/she has permission to access for the classroom he/she is not part of. 2, Can cover teacher edit content of any classrooms they are not part of? Cover teacher will not be able to edit content of any classroom he/she is not a part of. As mentioned before, he/she will only have view-only access. 3. What parts of classroom can a cover teacher access? See the "Posts" in the sidebar. View comments & replies on every post. Comment on a post or any comment (and cannot see the comment box). Like a post, comment or replies or select "I have the same question" for a question. Create, edit or delete any posts / comments / replies in the classroom. 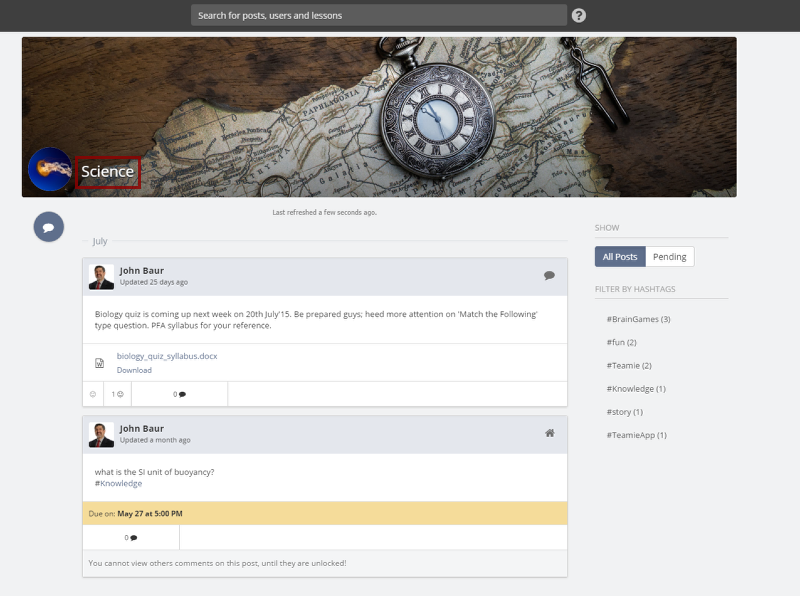 In a nutshell, a cover teacher can view the newsfeed interactions in the classroom.